A land manager recently contacted me with questions about overseeding alfalfa. Her alfalfa stand is diminishing but not to the point of giving up on it. Rachael Long, Yolo County farm advisor, Dan Putnam, UC Davis alfalfa specialist, and Mick Canevari, San Joaquin County farm advisor emeritus, presented on this topic at the Alfalfa and Forage Symposium a few years back and wrote up a proceedings paper on this topic. Additionally, there is a production manual which is available through the UC ANR catalog. 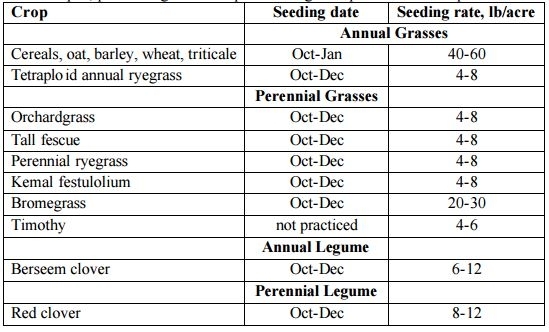 The table below names seeding rates for various annual and perennial species that could be overseeded into alfalfa. The rates have a range (e.g. 4-8 lbs/acre). First, consider the field conditions and the alfalfa stand in order to pinpoint a rate in that range. For example, if the alfalfa is sparse, <3-5 plants/ft2, then perhaps aim on the high end of that range. If two overseeded species are desired (e.g. one grass and one legume), then the seeding rate could be reduced by 25-30% for both species. So, for example, if orchardgrass and red clover are to be planted over a sparse alfalfa field, then instead of planting the high rates of both, 8 and 12 lbs/acre, respectively, the rates could be reduce 25% to 6 and 9 lbs/acre, respectively, when planting both species. The reason it is not recommended to overseed with more than two species is because some of the species will outcompete others. The ryegrasses (annual and Italian) are very vigorous and could outcompete red clover, for example. Orchardgrass or tall fescue are best paired with red clover. Berseem clover and a ryegrass, however, could work well together because they have similar vigor and growth timing. Overseeding should take place in the fall, and ground preparation is important. Scratch up the soil with a harrow; then broadcast the seed, and roll it to slightly cover the seed. Keep in mind that with broadcasting equipment, if seed size is different, the heavy seed may settle to the bottom, and it may not result in a uniform planting of both species. Ensure that seed is mixed well before broadcasting, or use a grain drill. If substantial rain isn't on the forecast, it is best to irrigate the newly overseeded crop to ensure a good stand. With proper considerations, overseeding could extend the life of an alfalfa field by 2-3 years.